Who is going to be traveling this summer? Me ! Yes, I love my life of world wide travel. I also love the community of PatternReview.com. I volunteered to be a first time Pattern Review contest manager. And the contest is “Travel Wardrobe”. To enter this contest you MUST be a member (either paid or free) by May 14th, 2017. Voting for winners is done by all PR members. My role as contest manager is to answer questions, to clarify rules, be motivational, and to ensure that all entries are submitted correctly before the deadline of June 15th, 2017. 1. 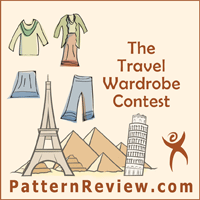 During the 4 weeks (approx) of the contest sew FOUR (4) items of clothing with your travel destination in mind. All sewing is to be done during the 4 weeks of the contest. 3. Please note that while accessories such as scarves, jewelry, wraps, etc form an important part of wardrobe planning, they will not count as any of the 6 (4 sewn plus 2 other) items included in the contest. You may sew them and use them for styling purposes, but please do not include reviews for them in your overall project review. 5. Write 4 individual reviews and 1 Overall Review. The overall review will be the review entered in the contest and will link to the individual reviews. 6. In the Overall review show at least 5 possible combinations of the pieces and list all the possible combinations. Here is the link to the contest forum: I hope you all will use this contest for motivation for a travel wardrobe for a real (it could be going to Canton or Waco !) or imaginary destination. Official Contest Manager for Travel Wardrobe 2017 ! Previous Previous post: Dates for 2018 Retreat announced !